STARworks Ceramics is here to assist you with all of your clay and pottery needs. We specialize in making local North Carolina clay. We also carry ceramics tools, equipment and supplies from top manufacturers. With customer satisfaction being the key to our success, our staff is willing to help you in any way necessary. STARworks Ceramics is located in the Town of Star, only minutes from the Seagrove, the pottery capital of North Carolina. Visit local pottery shops, then complete your experience with a pottery or kiln workshop taught by our wonderful ceramic artists at STARworks. Workshops must be scheduled in advance. We have been testing and manufacturing local NC clay since March 2009. We offer 10 major blends of clay made in our processing facility. Learn more about our local clay bodies by clicking here! In addition to our own, we stock clay bodies made by Highwater Clays and Standard Ceramic Suppy Company. We have more than 100 different types of dry materials for clay and glazes, available in 1, 5, 10, 25 and 50 lb bags. We also carry ceramic tools and equipments made by some of the best manufacturers. Click the links below to learn more about the ceramic supplies we stock at STARworks. If you regularly mix bags of powdered clay from the big clay mines you may not need these, but raw clay from the ground must be processed with just such equipment as we have at STARworks Ceramics. 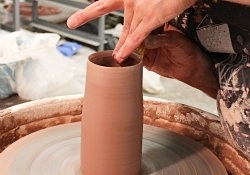 While it is time intensive, this process makes the best quality pottery clay. The raw clay naturally has a variety of particle sizes which makes clay throwing and workability better. Mixing with water hydrates the clay particles, while the pug mill removes air, making the clay even more plastic. This means not too much wedging before you make your own pottery or ceramic pieces. Join the STARworks Ceramics mailing list! Takuro Shibata is the Director of STARworks Ceramics. Takuro is a native of Japan, where he earned a Bachelor of Engineering in Applied Chemistry from Doshisha University in Kyoto. He has decades of experience in ceramics research, ceramics materials and studio facilities. Takuro has conducted numerous lectures and workshops on various ceramics topics and techniques. 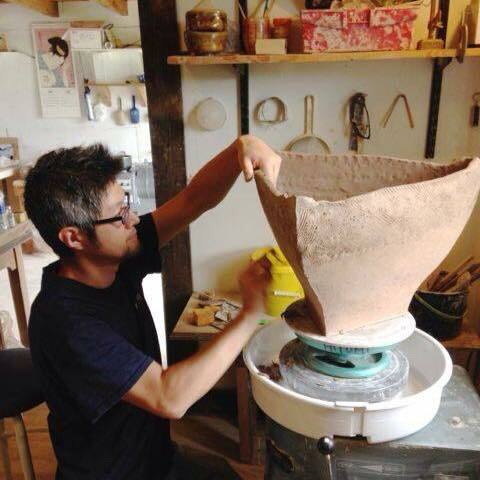 He has been a ceramics technical instructor at the Shigaraki Ceramic Cultural Park in Shigaraki, Japan, and a resident artist at the Peters Valley Crafts Education Center in Layton, NJ and the Cub Creek Foundation in Appomattox, VA. He and his wife own and operate Studio Touya in Seagrove, NC. Allison Daniel is a STARworks Ceramics Clay Factory Assistant. She holds a BFA in Studio Art with a concentration in Sculpture and Ceramics from UNCG. Allison is an interdisciplinary artist focused on ceramics, glass and painting, and has shown her work in art spaces along the east coast. She was born and raised in the Piedmont of North Carolina and enjoys teaching pottery classes, eating fresh food, and being outside with her cat. Adam Wiley is a Customer Service Representative for the STARworks Ceramics Supply Shop. He holds an AA in Ceramics/Fine Art from Hillsborough Community College & attended Kent State University for Ceramics. His personal artistic work is inspired by an early fascination with deconstructing objects and has grown into a passion for assembling art from mixed materials. For more information about Adam's work, visit www.CraftedToKeep.com. Sydney Williams is a STARworks Ceramics Clay Factory Assistant. A native of the Uwharrie Mountain region, Sydney earned her AA in production pottery at Montgomery Community College and her BFA in ceramic sculpture at UNC Charlotte. Sydney blends her backgrounds in craft and fine art with nature, creating large scale biomorphic sculptures that draw links between the human body and the wilderness. She likes to hike, kayak, and hug dogs in her spare time.